The off-season too often becomes a time of complete rest for youth athletes. 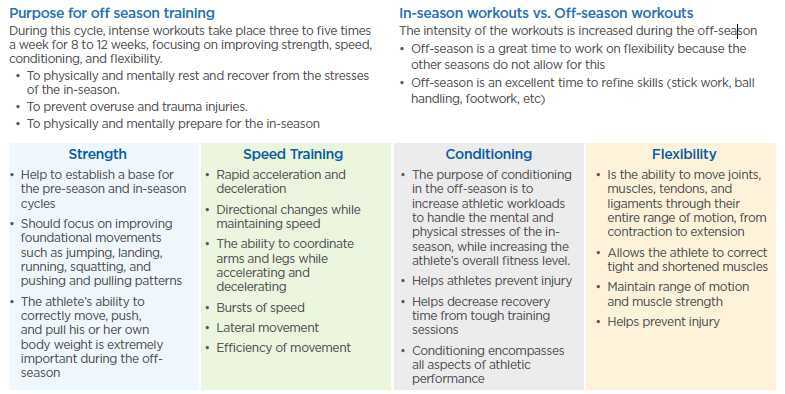 While everyone needs rest and recovery time from the mental and physical stresses of a playing season, the off-season does not mean an athlete should not train. But if the off-season doesn’t mean taking time off, what does it mean? Off-season is defined as a period of time when an athlete is not participating competitively in their sport. It is critical for all athletes to have some sort of off-season built into the year. Unfortunately, most high school athletes play multiple sports or participate in the same sport throughout multiple seasons. With this type of year round participation in sports, there is an increase in the number of injuries as well as the severity of the injuries. These are predictable and preventable consequences associated with overuse and lack of rest in young athletes that are always competing and that do not have an off-season.